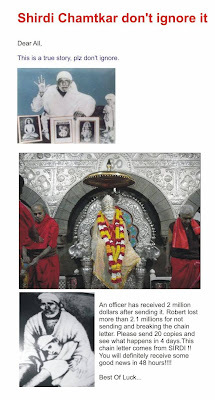 These days many mails are being circulated with subject line "Shirdi Chamatkar", "Shirdi", "Don't Ignore this mail". Such chain mails contain instructions to be forwarded the same mail to 10, 20 or 30 other people and attract good luck with the above picture. If not then you are welcoming bad luck. I receive such mails almost daily and delete it simply, everytime thinking how can it be stopped. It is purely superstitious act of the person who has started this. Even it is first not confirmed by the person who forward it or to whom it is forwarded, that they are real Sai Devotees or not and if they are not, it creates a negative effect not for the person who has forwarded it but for Sai Baba. In simple words, it is an insult of Sai Baba. For those who believe take such mails as silly things since they are already familiar with Baba's greatness and love. Again there is some insult of Baba on their part too. Following is an 'Eye opener mail' from a 'Non Sai Devotee' in this context which induced me to post it on the blog, so that many readers get access to such noble thoughts of a simple hearted person and also try to stop such mails to be forwarded from his side at least. I request the devotees who will be receiving this post either in their mail boxes or it is directly read on the blog, to save it and forward the same in reply to such chain mails. श्री सच्चिदानंद सदगुरू श्री साईनाथ महाराज की जय ! Even I am not devotee of Sai Baba, sorry to sending email to unknown person (you). Because I got similar in my inbox. However I am not afraid of not forwarding this mail to 20 persons. Because the person who forwarded me this mail was either devotee or afraid about Lord Sai. But neither am I a devotee of Lord Shiridi Nath nor frightening with Shri Shiridi Sai. I have Strong Belief on my Guru(God). As follower of my Guru, I should respect other Gurus as I do for my Guru. And I should see my Guru in all. Hence with same respect towards other Gurus I am forwarding it to you. But not with Fear. In reality the person (who forwarded this to me) has half knowledge about God/Guru. God only helps those devotees who offers hearty prayers in any form from any where. Only thing that require to get blessings of Lord is Whole hearted service. God will not be pleased with any thing which has been done in force of others or with fear. Devotee is identified by his/her earnest worship towards his Lord, but not by his/her fear with Lord. The Lord never frightens his devotees to offer prayers, people are miss understanding about Lord. For instance follow the links. I am not forwarding this to any unknown person about Sai Maharaj, but I did some exercise to find list of Sai devotees after that I am forwarding. Deleting of the Threatening sentence (Robert lost more than 2.1 million for not sending and breaking chain letter) from this original mail is up to you, to avoid miss understanding about your Sathguru infront of new unknown persons. Or as a follower of your Lord to bring discredit for him by keeping it as it is. Does Lord Shirdi Sai gets angry on breakers of Chain letter and curse them? Then they have half knowledge about God/ Lord Shiridi Sai Ram. Does Lord Sai himself said some thing like? This is a miss understanding about God that we have. God only listen to devotees who offer whole hearted prayers or do any thing with complete belief towards Lord.